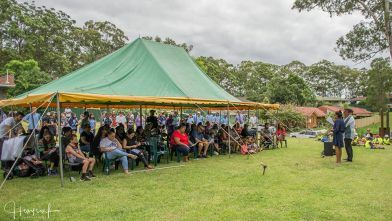 Members of the Gumbaynggirr community gathered to open the new park in Bellwood Aboriginal Reserve and remember the life of Caleb Jarrett, whose name the park now bears. Caleb was fatally stabbed in Nambucca Heads 10 years ago on the day before the 15 February opening ceremony. The community thanked Nambucca Heads High School for initiating the project through the Aboriginal education team at the school, with the work carried out by students through the Junior Local Aboriginal Land Council, which aims to mentor and encourage the leaders of the future. The project was led by local Aboriginal teacher Gary Cattanach, who has engaged the community in a partnership involving many students over a long period. “This was all organised on a voluntary basis through a Junior Land Council model, which was developed at Nambucca Heads High School,” Mr Cattanach said. The morning started with a smoking ceremony followed by a welcome to Gumbaynggirr by Michael Jarrett. Caleb’s mother, Kim, then spoke about Caleb and how proud and thankful she was to have the park named after him. “Caleb was a gentle giant who wanted to help everyone,” she said. Other guests also spoke about him, who was just 18 when he died, and how wonderful he was to be around. The park is now well grassed after students laid turf, has a grove of fruit trees, park benches that honour those who have gone before, play equipment and a large open space for playing games. “This is a beautiful addition to environment and to the Aboriginal community in Bellwood Aboriginal Reserve,” Mr Cattanach said. “This project is a fine example of community partnerships working together to produce better outcomes for our children and their families. “It is now fully managed and maintained by the Aboriginal community, with NHHS students involved in policy development with the community.